Nanyang Girls’ High School of the Republic of Singapore founded in 1917 by a group of businessmen who were deeply inspired by Mr. Sun Yat-sen’s view that women should receive an education. Today it is a premier independent school where every student is offered both English and Chinese as their first language. In Singapore, it is compulsory for all high school students to engage in an extra-curricular activity. 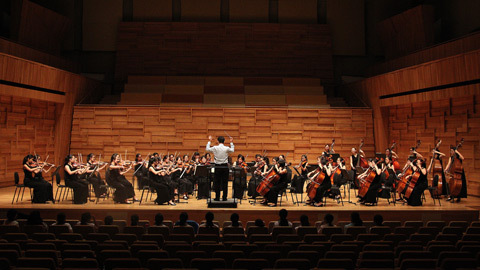 The Nanyang Girls' High School String Ensemble is one of the school’s 35 extra-curricular activities. The 60-member strong Nanyang Girls' High School String Ensemble meets to practise for 2 hours twice a week during the school term. It is conducted by renowned Singaporean conductor and violist, Mr Lim Soon Lee. The ensemble has consistently been awarded the Distinction award at the biennial Singapore Youth Festival Arts Presentation. In 2008, the ensemble performed at the prestigious Carnegie Hall in New York, and in 2009,had the honour of performing for the then President of China, Mr Hu Jintao, when he visited Singapore. 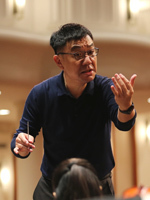 Mr. Lim Soon Lee began conducting Nanyang Girls' High School String Ensemble in 2014. With his caring leadership and versatility, he has brought out the best in the students. Mr. Lim Soon Lee obtained his Licentiate of the Royal Schools of Music for violin and viola in 1981. In 1983, under the Public Service Commission/Singapore Symphony Orchestra Scholarship, he graduated from the Eastman School of Music at the University of Rochester, New York, with a Bachelor of Music (Distinction). He was part of the Singapore Symphony Orchestra (SSO) from 1987 to 1997, during which he served as the Sub-Principal Violist from 1989 to 1997. He was chosen to represent Singapore in the 1988 World Philharmonic Orchestra in Montreal, Canada. In 1995, at the 4th Vienna International Music Competition, Mr. Lim Soon Lee was awarded the Jean Frederic Perrenoud Prize with a Certificate of Distinction in Orchestral Conducting. In 1996, he conducted the SSO for the delegates of the first-ever ministerial conference of the World Trade Organisation. In 2005, he was appointed Conductor of the Singapore National Youth Orchestra. Since 1994, he has been the musical director and resident conductor of the National University of Singapore Symphony Orchestra since 1994.